THIS UNIT IS IN STOCK AND READY TO SHIP IMMEDIATELY!!! Hurry supplies are limited to stock on hand! Unique patented* magnet + suction cup support included!Incredible stability in any position in aquariums with glass up to 15mm thick.Magnet is specially covered to prevent corrosion. Adjustable flow direction!The special sphere shaped connection makes flow directin quick, simple and fully adjustable. Produces a varying direction of water stream 24 hours a day. 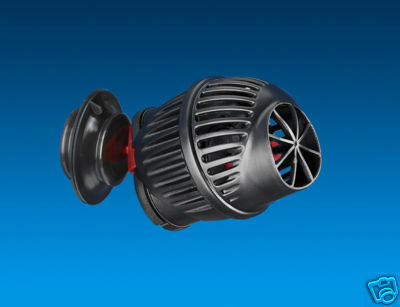 Produces better wave generation in your tank than one larger flow powerhead. Placement of multiple koralia powerheads in combination with sump returns, other filter components, skimmer returns, etc., will produce more varying wave patterns. Creates a healthier environment for both corals and fish. power source and if a power converter unit is required to run this 115v pump!